How to convert anaglyph to side by side? The de-anaglyph program on Peter's site is great, but too slow to process a movie. I know it already but it is under construction yet and just for SD. I can't correct the ghost effect on the right image. The left video is the original full-color 2D and the right video is the anaglyph. I suppose i have to fix it with leakcorrect but i couldn't yet. monoName = "C:\test\VSA-2D.wmv"	# Possible 2D video for one eye, if not set to "nothing"
What format is the original Anaglyph? DVD? How did it become a WMV? Are you 100% certain that the 2D and 3D videos are exactly synchronized? You need to set decimateHoriz to about 6 or 8 (not 100), and decimateVert to between 10 or 20 for decent results. BTW i'm not 100% certain that the 2D and 3D videos are exactly synchronized. Anyway i should try with a real 3D DVD. 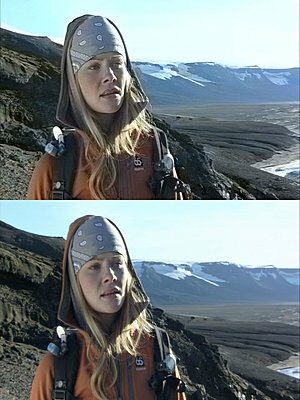 Here's a couple of frames converted from "Journey To The Center Of The Earth" DVD. Left is on top (converted) and right is on the bottom (from the 2D version.) The 3D anaglyph source is Green-Magenta, thus the converted left image is derived from the luminance of the Green and chroma from the 2D. All conversion parameters are at a neutral setting except that the left saturation is 1.2. decimateHoriz = 8, and decimateVert = 16. The most important thing is that I have not re-compressed the DVD video before the conversion. Both the 2D and 3D DVDs were extracted to MPEG2 with VOB2MPG, which does not recompress. This is why I asked about your WMV. Every time the anaglyph is compressed, the colors are distorted and it becomes very hard to recover the left and right luminance videos because a simple Green or Magenta filter won't work with distorted colors. If you look carefully at the left (top) images, you will see that the conversion is not perfect, but in motion, the flaws are less noticeable. Tony, thanks for your valuable feedback. I'll report back in a week, i hope. FYI:Those wmv files were original files, not re-encoded files. monoName = "C:\MBV\VIDEO_TS\test.mpg"	# Possible 2D video for one eye, if not set to "nothing"
Looks like you don't have the proper Windows DirectShow decoder for your audio file installed on your system. Thanks Tony, i seem to forget how to use VirtualDubMod. Btw, i've been trying with some 3D DVDs for two days. What's interesting here is i get playing loops everytime. For instance if the normal clip leght is 04:40, i get 10:00 minute clip. Final Clip Lenght must be as original clip lenght but i get double lenght. EDIT: I used VOB2MPG for extraction of whole mpg and used VideoReDo Plus for frame accurate cutting. Last edited by Seref Halulu; February 6th, 2011 at 11:30 AM. 2.) For My Bloody Valentine, the 2D version is the right eye view. The sample you sent me used the 2D as left eye, and then converted another copy of the left eye to produce the right; thus no stereo! So.... you want: isMono = "monoRight"
3.) The monoRight setting revealed a software bug in AnaExtract.avs. I have attached an updated version which fixes the bug. Sorry! 4.) I'm not sure about the "repeating" problem. It probably has something to do with your source files. Perhaps one is longer than the other. If you want to send me the two source files, I'll take a look. 5.) With MBV you can set decimateVert = 20.0 or more. This will help with the color bleeding on the converted left image. 2) VirtualDubMod or GraphStudio crashes when trying to open new full movie avs while MeGui opens the same avs without any problem. When i check what MeGui is using i saw LAVF directShow Source Filter. I will check out with the new parameter avs and new core AnaExtract avs. Last edited by Seref Halulu; February 6th, 2011 at 01:17 PM. It is fairly easy to see whether the 2D version is left or right. Load up the anaglyph version in any media player and find a frame where there is a good 3D effect. Put on your anaglyph glasses. You'll notice that your right eye can "look around" the right edge of objects in the foreground and see parts of the background that are hidden from your left eye. Do the same thing with your left eye "looking around" the left edge of foreground objects. Remember what was hidden from one eye, but visible to the other eye. Then load up the 2D version and seek to the same frame. You should be able to notice what is hidden behind the foreground object and compare this to the left and right anaglyph views that you previously observed. The 2D version should match either the left or right anaglyph view. Then you will know. If you have some video editing software (Premiere, After Effects, Vegas, etc...) you can just stack the 2D and the Anaglyph versions on two timeline layers, being certain that the two videos are synchronized. Put on your anaglyph glasses and turn on and off one of the layers until you figure out whether the 2D matches the left or right anaglyph view. Be aware than some media players and editors have trouble accurately seeking to a specific timecode with MPEG2. You may just have to let it play from the beginning and just pause the player at a good 3D effect. EDIT:Even i seperated left and right (with Adam's tool) and re-encode them seperately to x264 and avi. After encoding i get loop. I don't understand "how this happens" at all? Last edited by Seref Halulu; February 6th, 2011 at 03:56 PM.